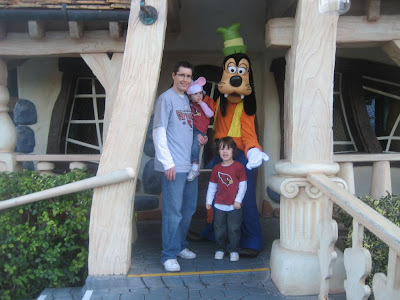 The next morning, we headed off, in our matching Cardinals shirts, to our first character breakfast at Goofy's Kitchen, what a magical place! This was Tyler's first encounter with the characters, and I can tell you she was NOT impressed. She was OK, as long as Pat was holding her hand, but she was even BETTER if the character didn't have a ridiculously large costume on. She really enjoys dancing, so when the characters invited her up to help make a cake, she didn't hesitate. 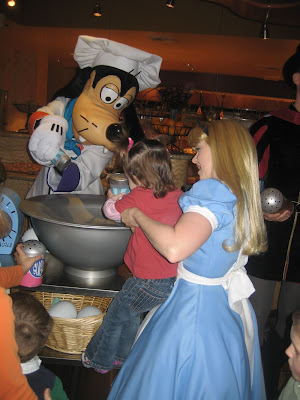 She even let Alice pick her up to put the sprinkles in the bowl! This restaurant is so wonderful because the buffet has a kid size area where they can pick out their food themselves, and my kids LOVE to do things themselves! After breakfast, it was off to Disney, and I don't think I have a SINGLE picture of Tyler looking at me when trying to take a picture with the characters until MAYBE DAY #4 because she would literally STARE THEM DOWN (oops-she is looking at the camera in a few, but you know what I mean) to make sure they didn't make any sudden moves. Jackson would run up and talk to them all, and then Pat would run and get in the picture with Tyler! There was no screaming and crying though unless the character tried to touch her! 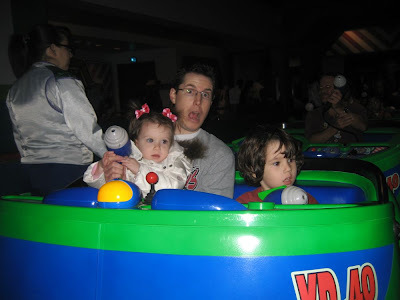 I managed to get a picture of Jackson, Pat and Tyler on the Buzz Lightyear ride, you can see how it is a very fun, interactive ride. You compete against the person you are riding with to shoot as many targets as possible. 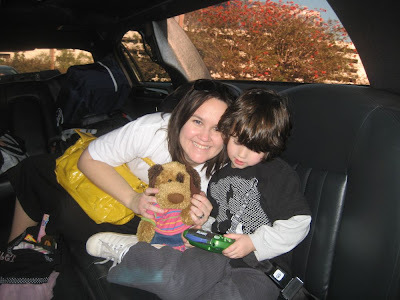 As I was flipping through the pictures, I was so glad when I saw this picture of Pat, Jackson and Tyler with Minnie. 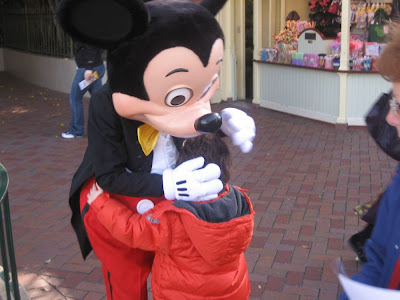 This picture was taken later in the afternoon, and all Tyler wanted at this point was to see Minnie, so when we saw her, we jumped on the chance, but she started to back away into one of the magical places characters escape to. This FORTY YEAR OLD LADY was totally hogging her, and wouldn't let my TWO YEAR OLD in to see Minnie, but there was no way that Pat or I were going to let her get away without a fight. 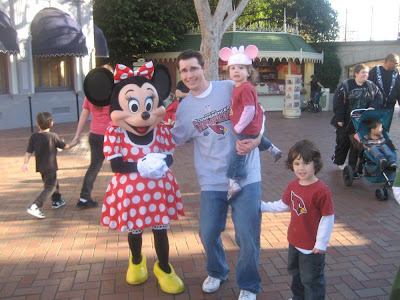 We abandoned the strollers, I am yelling, "Minnie, can I get a picture of you with my daughter? ", while Pat literally has his arm around her to stop her from moving. He said the whole time I was taking the picture she was moving backwards (she was trying to get in between the green and blue awnings), that's why Jackson is so far outside the picture frame. I thought I was going to have to throw down in the middle of Disneyland just because some lady wouldn't let Tyler in to see Minnie. How about we saw Minnie again like 10 minutes later at her house in Toontown, all the drama for nothing, but REALLY? 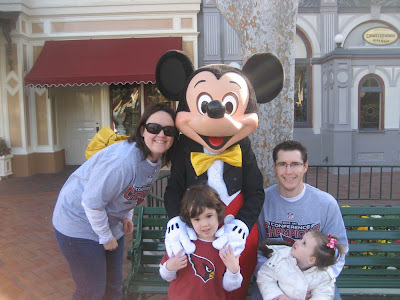 I have to break this down, otherwise, you will become overwhelmed, stop reading and not get to hear about all the FANTASTIC things that my kids did while at Disneyland! SOOOOOOO, here goes! 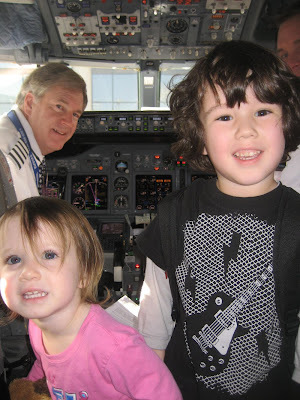 First, I thought it was against all regulations, but we had this AMAZING flight crew when flying to OC, and they stopped us on the way in to ask me if I had a camera, and if I wanted to take my picture of the kids in the cockpit! HELL YEAH, when is that ever going to happen again! They were both COMPLETELY overwhelmed, but I managed to snap a few! I think they both just wanted to push all the buttons, but they behaved like CHAMPS and didn't touch a single one!! 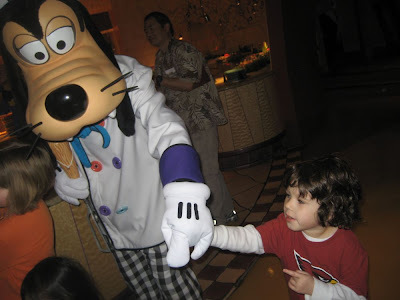 When the flight attendants were doing their "good-bye" announcement over the loud speaker, they started off by saying, "Jackson, Mickey called, and he is waiting for you at Disneyland!" I don't know what it is about that kid, but he attracts all kinds. Some man asked me at Dunkin' Donuts the other morning when he was going to Hollywood because he is beautiful, and the man was like 60! I don't even know what it is about him, but he is something else!!! 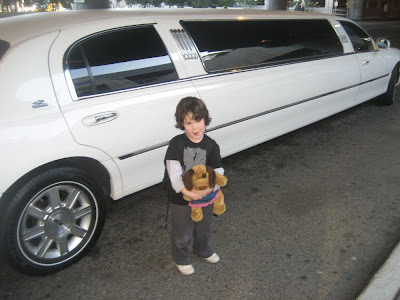 When we arrived at the airport, there was a limo waiting for us-DON'T GET EXCITED, I travel by limo when we go places because I don't feel guilty for not bringing car seats, and THAT IN AND OF ITSELF is worth every SINGLE penny! Pat got to pre-party before making it to Disneyland! 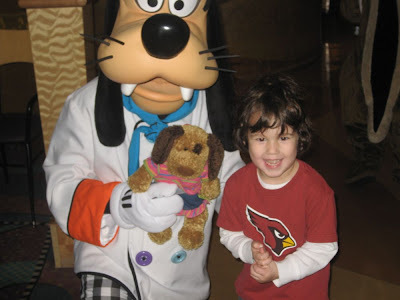 We also brought Sassy, the classroom stuffed dog, with us to Disneyland, so she may be present in many of the pictures, but it was really exciting to the kids that Sassy went with us, soooooooooooo we did it! I don't think Tyler was READY for Disneyland. 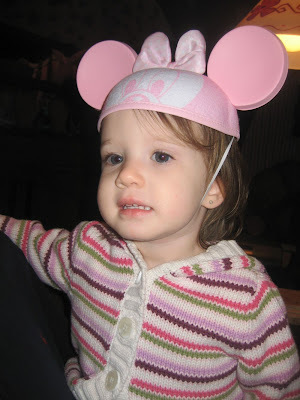 When we got there Monday night, it was darkish and quite overwhelming, she didn't see Mickey or Minnie, so she didn't understand this was Disneyland, but they both got some pretty cool hats that night! 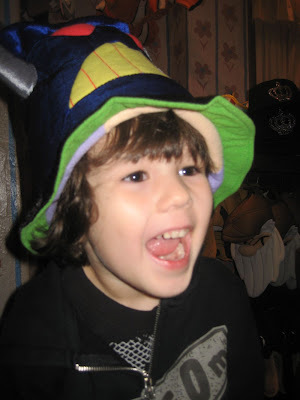 Jackson's is a reversible Buzz Lightyear/Zurg reversible one! I can laugh about it now, but the Buzz Lightyear ride and I were going to have issues the first night because Jackson wanted to go on it, OVER AND OVER AND OVER AGAIN! We went on the tea cups, Buzz Lightyear and Alice in Wonderland, and those were LITERALLY the only rides he wanted to go on the rest of the night and the morning. He didn't even comprehend how many other rides are out there! I am feeling AWESOME, and I am hoping that my appendix is what was wrong with me the past six months. I have no pain, and I think this was the answer to all of my problems!!!! My mom and Pat were awesome about making sure that I didn't have to carry anything (the one limitation I had), and they would let me rest if I needed to! They really picked up a lot of my slack! I love them! 1. I don't think the parents in the commercial about Disneyland REALLY think their kids are funny when they say, "We're too excited to sleep!" because they are probably freaking EXHAUSTED from packing and getting everything ready to go in the morning. Sure, it is cute to us, but DANG packing for four people is EXHAUSTING! 2. Morphine is the greatest thing ever invented. Aside from the headache it gave me on the side, it seriously killed the pain faster than anything I have EVER BEEN GIVEN! I think it is the first time I EVER had pain medication through an IV, and I think I could very well be hooked. Someone mentioned yesterday that they were shocked they gave me pain medicine BEFORE they knew what was wrong with me, but I think they knew there was NO WAY they were getting within an inch of me to ultrasound me without it! HA! 3. It is a blessing that these crazy medical things happen to me because as much as I hate to admit it, Pat has more patience than I do (saw a glimpse of PRE-LAW SCHOOL PAT!). He is a WONDERFUL caregiver, sleeps in the craziest beds and positions, wakes up every thirty minutes to fulfill my every need, and I just don't know if I have it in me to do that. Pat laughed the other day when I was telling him how great he was, and he said, "Well, I know you would do the same for me!" We both know MAYBE NOT! 4. The Monte Cristo sandwich at Cafe Orleans, cannot wait to eat one EVERY DAY! 5. Carmel Kettle Corn at Downtown Disney, YUM! 6. Missing some good friends in cities far away!!! I wish we could just all live within 50 miles of one another. I think life would be sooooo much better if we could see one another more often. They mean so much to me! 7. Rylee Rose's features are about the roundest things I have ever seen. 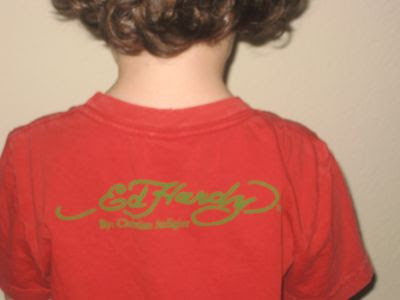 My kids have always had REALLY almond or oval shaped features. Nothing about them is round. Rylee has round eyes, a round nose, face, head, ears, lips, just really round, it is so cute, she is like a doll! I don't know if you can tell in the picture above, I just thought it was cute, my kids are obsessed with her. 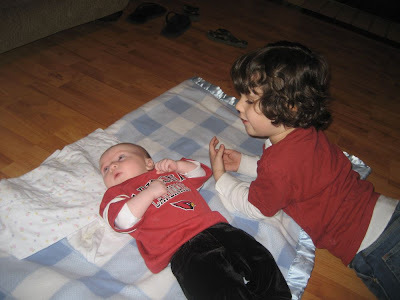 In this picture, Jackson is sharing his blanket with her and probably infecting her with strep! 8. 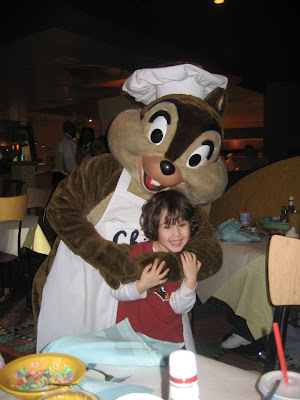 Tyler is scared of Chuck E Cheese, like deathly afraid, I am REALLY nervous about how she is going to react to all the characters in Disneyland!! Surely she will get over the fear eventually right? She will love the rides and looking at the statues, but the moving characters, PANIC!???!!! I will let you know! 9. Even though I have multiple pairs of black pants that are exactly the same, I have a favorite, and I don't think people know that I have a TON, I think they think I wear the same ones every time I drop my kids off at school! 10. My New Year's Resolution was to eat one fruit and one vegetable every day. I was TOTALLY rocking it, until I was in the hospital. I have to get back on track because Shannon told me that there is a saying, "40 days, and it becomes a habit!" Looks like I have to get back on track, but I felt so good including these in my diet. I want to succeed at a New Year's Resolution, I always say exercise, stop biting my nails, or something else I will never do, so this year, I set the standards low, and I was eating more like 2 fruits and veggies a day. WARNING-DO NOT READ IF EASILY GROSSED OUT!!! I cannot poop, I want to poop, and I am going to freak out if I don't poop soon. Haven't pooped since Sunday, and I know that I have not eaten a TON since then, but FOR THE LOVE, we have had Outback Takeout, Pizza Hut, and plenty of other stuff that I have ingested to help me poop!!!!!!!!!!!!!!!!!!!!!!!!! So uncomfortable! If you want to use a politically correct term in place of poop, go for it, but I have a two and four year old-IT IS POOP! The last four or five days have been kind of dramatic, did you miss me!??? Friday I went to the doctor because of the side and back pain that I have been having, and they told me it was just because of the ovarian cysts that I have, and to start taking some birth control, that would hopefully regulate it and help the ovaries to not have to work so much. The pain had been going on for about two weeks, so they also prescribed a pelvic ultrasound that was supposed to done today because it was the soonest I could get in. OK, I would wait. Sunday, half way through the Cardinals game, I was doubled over in pain in my bed, but I thought it was because the foods I had eaten during the game were too rich, and that I would feel better in the morning. WRONG! One slice of toast and a little cheese Monday morning, and I could not even stand up. Pat came home from work at about noon and took me to Paradise Valley Hospital because it was the closest! We started there with SEVEN blood samples (I told the lady-Becky, sweetest ER nurse ever- I didn't even care how much blood she needed, she could have it all if it cured the pain! ), a pelvic ultrasound and ultrasound of the abdomen. The ovarian cysts were very present, but I had elevated white blood cell count, so it meant that my body was fighting an infection somewhere. Off to have a CAT scan of my stomach. In which the radiologist reported a "slight case of appendicitis". The ER doctors were CRACKING up, either you have it OR YOU DON'T! There is no slight case, but the general surgeon wanted another CAT scan with contrast (this funky blue stuff that they stick in your IV and makes you really hot-hot like you just peed your pants-really weird! ), so I was whisked away for some more testing! This is around seven o'clock, and at this point, all I am REALLY concerned with is that I am missing The Bachelor. Some girl-don't know her name, but she was like 5 foot nothing and 90 pounds, so I had NO IDEA HOW SHE WAS GOING TO PUSH ME, finally comes and takes me to my room around 8:30 PM. 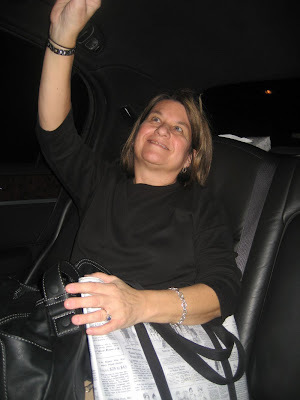 Let's stop and reflect here, Pat had gone home to grab a few items for me because when he left, no one was sure if I was going into surgery, what the heck was going on, all we knew was that I was being admitted. This sweet girl, managed to wheel me upstairs (the largest person she had ever pushed BY HERSELF was 400 pounds, so I felt light as a feather), and as soon as she pushed me in the room, I was a pile of tears. The room was a double room, I had pictured private-those are the kind of hospitals I am used to, it was creaky, dark and old, not very inviting, and I was all alone. I didn't say anything until the CNA came in, and she was like, GET OUT OF THIS BED, it is weird, move to the other bed, and we are not putting anyone in here with you, your husband can sleep in that bed, I think her name was Mary, but I can't be for sure-SHE SAVED ME! I literally sit down in the bed, and some nurse comes in ranting and raving about how "She is going to surgery at 9:30-what the hell!" What did the other CAT scan show, what the hell is going on, where is Pat? Needless to say, I start freaking out. The nurse, Wendy, starts freaking out, trying to ask me all these pre-op questions as fast as humanly possible, she knows nothing, I know nothing, and at 9 PM, some guy shows up to take me downstairs! We go downstairs and wait TWO HOURS for the doctor to show up, and during this two hours, they couldn't give me any pain medication because they wanted me to be able to sign a consent form and talk to the doctor when he got there. So not only was I in pain, I was coming down off my morphine high of the last three/four hours. It was a TORTUROUS two hours. The OR was EMPTY, EMPTY! I have no idea where they found these nurses that were there. There was no one there except the anesthesiologist, us and a few CRAZY nurses, they don't do surgery except in an emergency at night, so it was SPOOKY! The doctor shows up, talks about all the horrible possibilities that I would have been HAPPY to be drugged for. They rush me off, and the next thing I know, I am waking up to the laziest, bitchiest nurse out there, who REFUSED to get Pat because she was alone. Pretty sure you could have opened the door and got him because we were the only ones down there, and just refused to get up from her chair because she weighed twelve thousand pounds. Good thing Pat got in there when he did because whenever they would give me the pain meds, I would start to lose oxygen, and she just kept yelling across the room, take a deep breath. He was like, "Yeah, could you hook her up to some oxygen, this is what happens every time she has the medicine!" Good thing Pat was doing her job, OMG, I was so happy to get out of recovery. That is truly my only complaint about my stay. Everyone else was super nice, I was VERY WELL taken care of. Pat was encouraged to order food as my guest, which he LOVED, and he had a bed, no matter how much it rattled or squeaked, IT WAS THE WEIRDEST BED! I had a few meltdowns in the middle of the night, when I was SOOOOOOOOO tired that I didn't want the IV in, the blood pressure cuff, the things on my legs, the heart rate monitor, etc attached to me, so I would try and rip them off, but only because I wanted to go home so bad. Pat was wonderful through it all, I would have killed him by 3 o'clock in the morning, but he was super patient with me. I must have been on my very best behavior because I was not supposed to be released until last night, but I got to come home yesterday around noon. 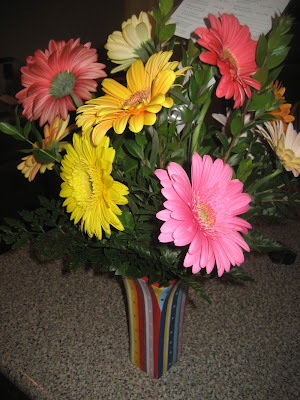 I received the prettiest flowers from Pat's work, I was quite the celebrity there yesterday (I included a picture because the flowers and vase were SOOOOOOO cool! ), and people have sent me all sorts of goodies! My favorite goody is the hope that once this heals, all the pain will go away. I feel like I have been suffering with this pain forever, so if I start the birth control and the pain from my appendix goes away, maybe it will just all work out! 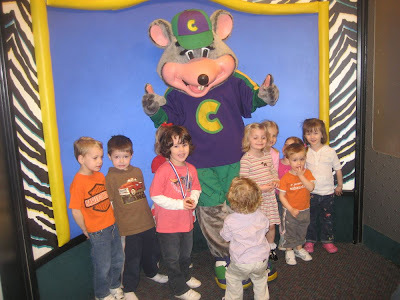 Last night we had Jackson's birthday party at Chuck E Cheese. I have got to admit, Chuck E Cheese on a week night, is like the BEST birthday party EVER! We had nearly the whole place to ourselves! A lot of his friends from his class came, and he got a whole lot of loot, one lucky, loved little boy! Tyler and Jackson also got to wear their matching Batman and Robin shirts, I love matching clothes, and I HATE that they can't wear them more often! Watching the Golden Globes the other night, I was drawn to the story written by Richard Yates, of a young couple just starting out. I had not heard much of Revolutionary Road, but after watching the most beautiful Kate Winslet, I thought to myself, I must read the book before I see the movie. Of course, when I went to Target to look for the book, the only copy they had was the one with Leo and Kate on the cover, and I hate that I am unable to create the characters in my head, but I will make do! Now, I am not one to BUY books, usually my mom buys them, I go to the library, swap with friends, etc. However, after reading the back of the book, I had to buy it! I don't know how it ends, if it is tragic or romantic, happy or sad, I know nothing because I am only on Chapter Three, but I do know that I cannot put it down because it is ALMOST as though I am reading my life on the pages. I am being quite dramatic, the book is set in the 50's and life really was MUCH different then, but I do know that as a young couple starting out in this world, I think we all have so much more in common than so many of us will admit. The book seems so honest, and it is sooooooooo refreshing in a present day society that expects us to be happy all the time, have perfect children, eat perfect food, look perfect, and overall be perfect. Unfortunately, Richard Yates died in the early 90's because when asked who I would like to meet at a dinner party, living or dead, I would really LOVE to sit down and meet the man that could write a story which transcends generations. "In the hopeful 1950s, Frank and April Wheeler appear to be a model couple: bright, beautiful, talented, with two young children and a starter home in the suburbs. Perhaps they married too young and started a family too early. Maybe Frank's job is dull. And April never saw herself as a housewife. Yet they have always lived on the assumption that greatness is only just around the corner. But now that certainty is about to crumble. With heartbreaking compassion and remorseless clarity, Richard Yates shows how Frank and April mortgage their spiritual birthright, betraying not only each other, but their best selves." DISCLAIMER: Don't get all dramatic on me here and think that Pat and I are headed down some terrible road, that's not what I connected with here. I connected with being young, starting a family, not being sure of what comes next, finding happiness in being a housewife, and just overall being a young married couple. For the record, those of you who know Pat know that his job is FAR FROM DULL, so I also did not connect with that statement in the book. 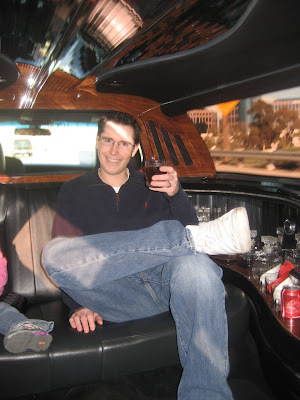 He has a super cool job and deals with all sorts of people on a daily basis. This disclaimer is EXACTLY what I think is wrong with today's society, but since I am a part of it, I will play the game! Enough typing, must spend my time reading! Since it appears as though there is already a child star that looks very similar to Jackson (picture to left)staring in Bedtime Stories, I thought I would come up with some other ways that this child could make me some money! 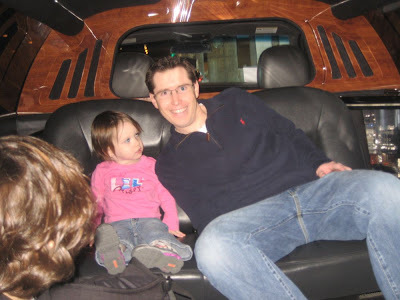 As a side note, I think the child looks a little like him, but DEFINITELY NOT AS CUTE, :-P! After listening to the most obnoxious sound on Earth ALL WEEKEND LONG-football announcers-I have decided that this would be the PERFECT job for a little boy who LOVES the sound of his own voice. He could repeat key phrases and talk incessantly and THINK people are actually listening to him! Phrases like: "WOW! ", "I think you're being a little dramatic! ", "That's cuckoo! ", or "I don't think so!" 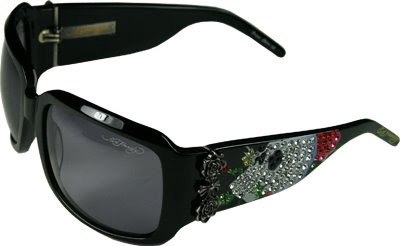 Would fill the dead air time and make me some money! Seriously, I don't know what makes him think that he needs to talk from the time he wakes up until the time he goes to bed. He is four rooms away joining in conversations that are going on between adults-SOOOOOOOO ANNOYING! OBSESSED with all video games. He can pick one up and master it in a matter of minutes! Thinking that I should register him in some tournaments, some of those have HUGE prizes! Not sure about this career though because it seems to be detrimental to your social life, and he would probably make a lot of enemies since he would still be talking while playing the games, and I think the competition would probably be more introverted! Granted, it is in his blood, BUT really, you could look outside and see that it is raining, and Jackson would somehow try and convince you differently. Pat feeds into this a lot since he ALSO LOVES the sound of his own voice, and Pat will actually sit there and debate with a four year old. Really, if Pat wins, does it make him feel successful!??? Go pick on people your own size at work! 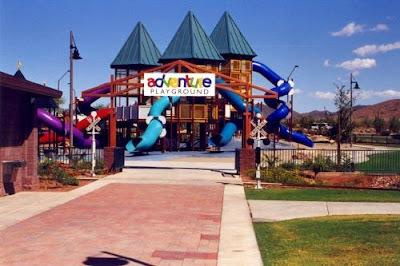 Yesterday was the MOST ENJOYABLE DAY I had with the kids in probably like a year! We spent the morning at Anthem park, they took good naps, and then when they woke up, they played in the playroom until dinner and baths. 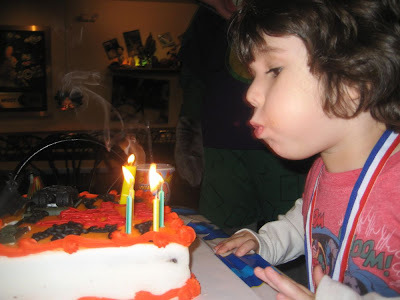 Finally, before we went to bed, we watched Dora Saves Three Kings Day, which I thought was ridiculous seeing as how they couldn't really explain what Three Kings Day is, and all it really told the kids was that you eat cake and one person finds a surprise in theirs! 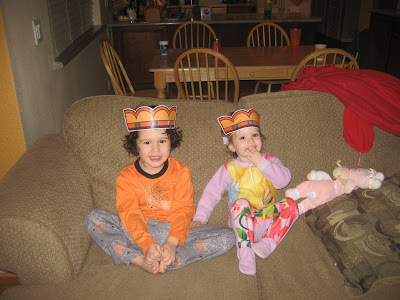 Anyway, here they are looking stinking cute in their Dora Saves Three Kings Day Crowns!!! I wonder what today will bring since they were so good yesterday! 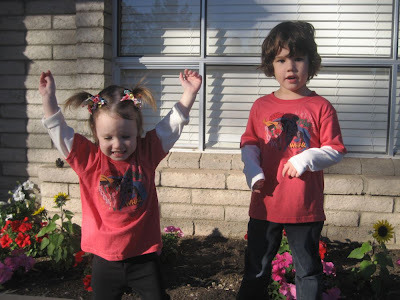 I am already super annoyed with their behavior this morning, so it is REALLY good that they go to school today! Would have to go see a plastic surgeon before age 1!!! Poor thing was born with a bald spot that had a red marking, and it turns out that if it is not removed, it could turn cancerous as she gets older. So, after meeting with the dermatologist today, she has to go see a plastic surgeon in the very near future. They will remove it when she is about 6 months old, and then she will be left with a "y" shaped scar and NO bald spot! At this time, I would like once again sing the praises of Phoenix Children's Hospital! They are amazing! I found the name of this doctor that she went to on their website, the pediatrician my sister and I use also referred Katie to him, she went, he was awesome. Knew what it was in like two seconds when for a MONTH people have been telling her that they have "NEVER seen this before", "have no idea what it is", etc. Anyway, now she was referred to a plastic surgeon there, so I am very content knowing that my one and only niece is in their hands! I wish I had a ton of money because I would buy a ton of entries into their raffle! It is too bad it is a recession because I would encourage all to buy a ticket, or just donate money! I would love to be on their Board of Directors, but I am having a difficult time figuring out how to do it. If anyone knows, please let me know! P.S. How excited am I for The Bachelor tonight, thank GOD something is starting on television otherwise, I might shrivel up and die! 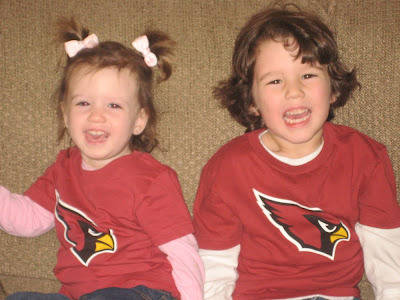 I voted against them in my Football Pool, but my kids sure look cute sporting their shirts! I hate coupon schemes that are not really coupons at all. 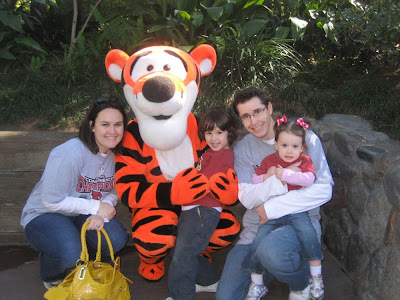 We are booking our Disney vacation this week, and what do you know, we got a coupon in the mail advertising 30% off, so I called, and I sat on the phone with some IDIOT-I swear it was her first day-for FORTY MINUTES, and every time she ran the numbers, I got a different price. Then, it turns out that the 30% is on the room only, which I would be fine with, but if I booked a package (room and tickets), then the 30% would not apply, AND I would not get my morning in Mickey's Toontown and Magical Morning in Fantasyland! OMG! Seriously, these people talk circles around you-GOOD THING I STILL HAVE SOME OF MY BRAIN CELLS LEFT! Next time, I am going have my negotiator husband call, I think he would talk circles around them! I just get so frustrated, but Pat gets off on it, he thinks it is so entertaining!